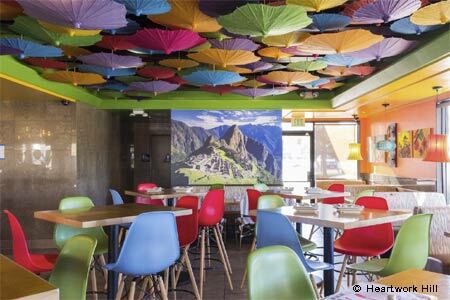 At Pisco Rotisserie & Cevicheria in Carlsbad, guests can enjoy Peruvian food with a focus on fresh ceviche and rotisserie chicken. A compelling array of pisco-inspired cocktails (made with Peruvian white brandy) complements the cuisine. 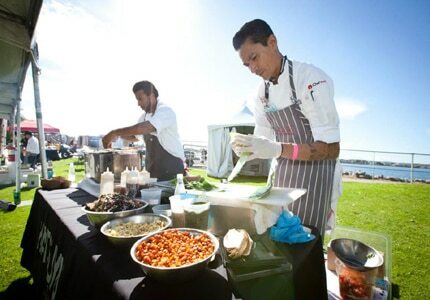 Pisco Rotisserie & Cevicheria, 5970 Avenida Encinas, Carlsbad, CA 92008, 760-438-1212. Dija Mara is an Oceanside restaurant serving up innovative Southeast Asian plates and biodynamic wines. This take on nasi goreng, a Balinese staple, means a medley of bay shrimp, duck confit and pork belly over fried rice with a fermented hot sauce and sunny side up egg. Dija Mara, 232 S. Coast Hwy., Oceanside, CA 92054, 760-231-5376. Little Italy steakhouse Born & Raised steals the show with its clever design, service as performance and over-the-top menu. The gold scripted menu speaks of caviar and crudo, lobster bisque and beef like dry-aged Tomahawks and Wagyu; and surf and turf and side dishes such as smoky creamed kale and carrot vichy in maple syrup with a touch of Fresno chili heat. Born & Raised, 1909 India St., San Diego, CA 92101, 619-202-4577. The Smoking Gun offers Southern-inspired comfort cuisine and cocktails in a colorful retro setting in the Gaslamp. Chef Kevin Templeton serves up tasty plates like brisket, pulled pork, biscuits n gravy and cornmeal fried catfish. The Smoking Gun, 555 Market St., San Diego, CA 92101, 619-233-3836. Take your taste buds on a walk down memory lane! Check out our exclusive closed restaurant database for San Diego to virtually visit your favorite dining spots from the past. Mr. Tiki Mai Tai Lounge, R.I.P. The Hake Kitchen & Bar in La Jolla has closed. The Hake Kitchen & Bar, 1250 Prospect St., Ste. B10, La Jolla, CA 92037, no phone. Café Chloe has shuttered. The restaurant boasted a highly enjoyable setting and served solid French bistro fare. Cafe Chloe, 721 Ninth Ave., San Diego, CA 92101, no phone.